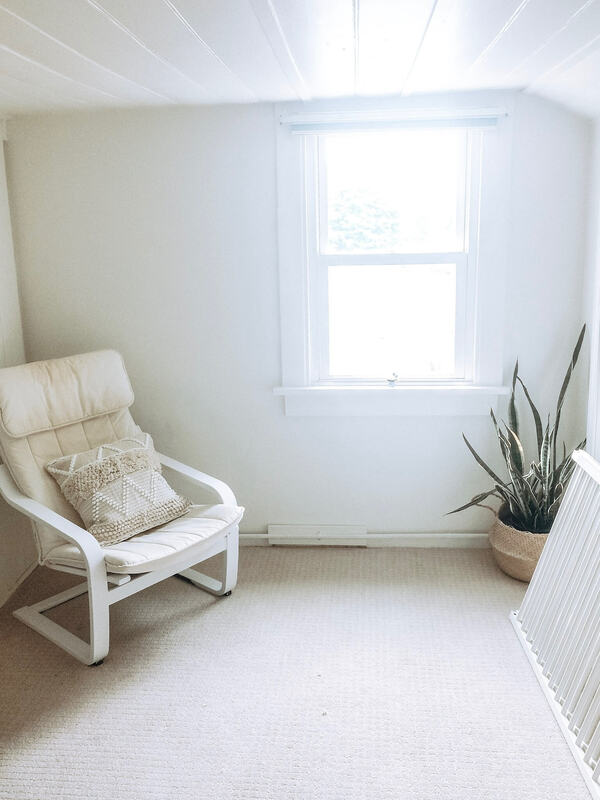 This week was a big week of changes in our tiny little nursery renovation. 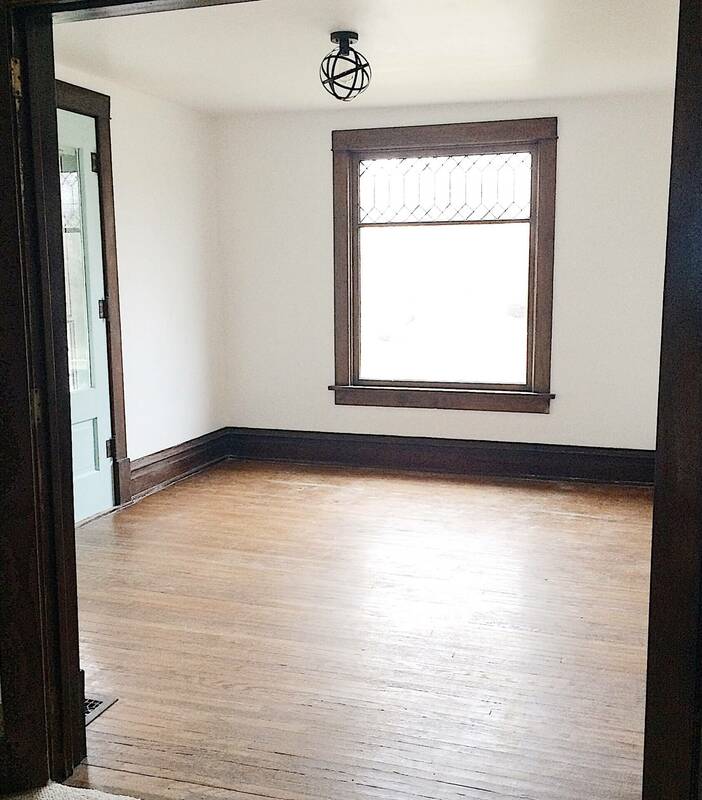 For those new here, we are participating in the $100 Room Challenge where we give ourselves $100 and a month to completely transform a room. We chose to turn our craft/office/storage room into a nursery for our little guy due in November. To catch up on the transformation, you can read Week 1 here and Week 2 here! So this week, my husband’s big job was to install this pallet wall where the crib will go. 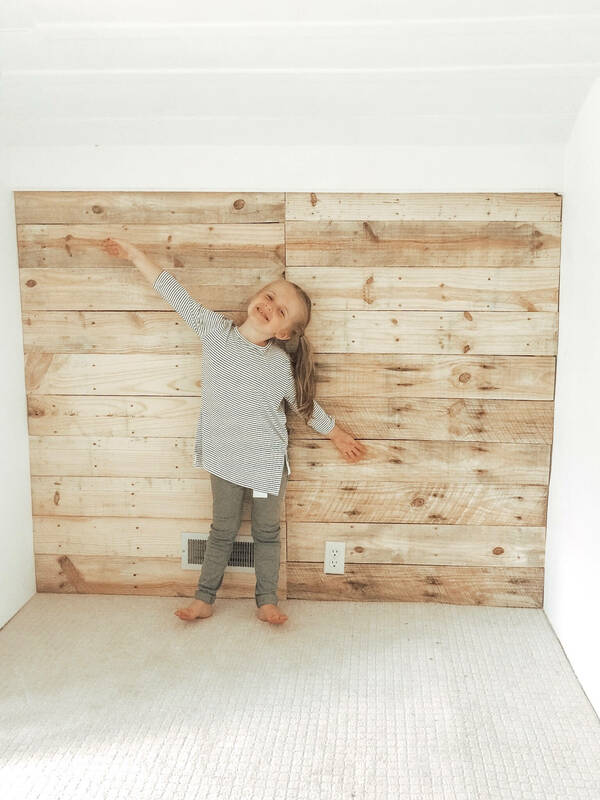 I knew I wanted a feature wall here, and since budget is the name of the game, we went with pallet boards which were completely free from a local business. It was so easy, I feel like it doesn’t even need a tutorial. He framed the wall with scrap 2x4s from our stash, then nailed the pallet boards to them. Since this is an old house and electricity was wired in MUCH later, I love that the cords are no longer visible going up to the electrical socket! I just love the rich texture it adds to an all white room! Speaking of texture, I was so excited to roll out this rug I bought a month ago in preparation for the $100 Room Challenge. It’s soooooo super soft and the best part? Its machine washable!!!! 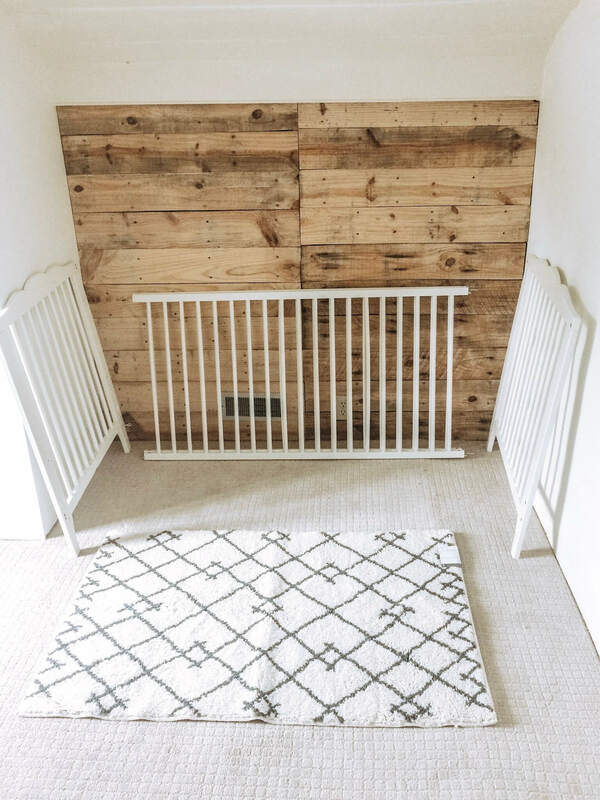 I feel like that is just a must for a nursery! It is originally $30 but I snagged it on sale for $21. You can buy it here! This has been my view most evenings as I am working hard to finish crocheting an ottoman cover for an old cushion I had lying around. I am by no means a crochet expert, so this is really just one big experiment that may fail horribly!! As you can see, the cushion is a box cushion, so my first step was to measure the sides and crochet a square the same size. It took a bit of trial and error to find my gauge, but once I did things went quite smoothly. I made two of these squares, one for the top, and the bottom as you can see. The next step is to crochet the sides then sew them all together. I think I’ll use a single crochet stitch to attach them, as I like the look of a big seam connecting them. 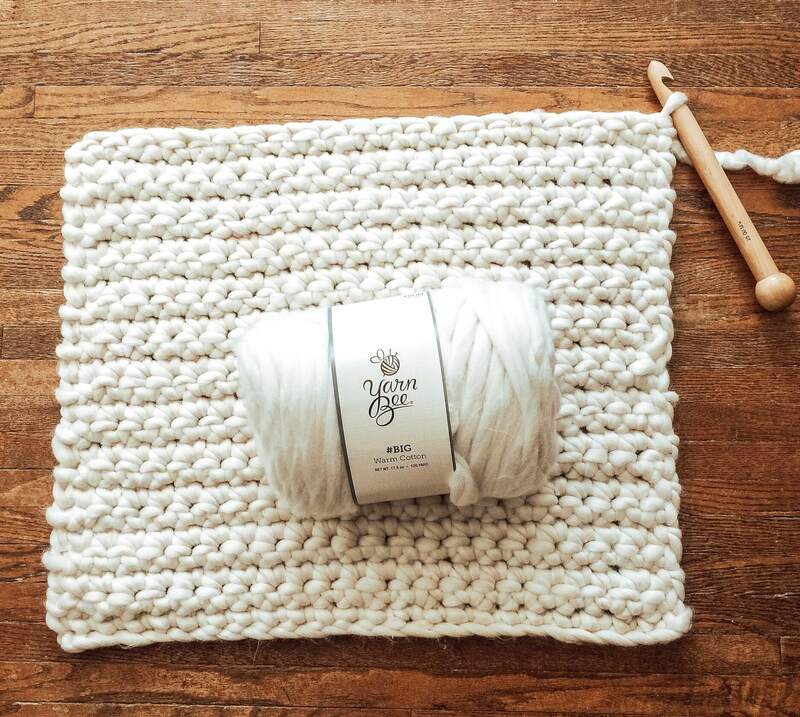 If you’re curious, this is the jumbo yarn I’ve been using and you can find it here. It is so soft and so easy to work with and it looks like a dream! I’m using my jumbo 25mm crochet hook. I’m still feeling pretty confident because the only thing I really need to buy is a curtain rod and maybe some picture frames for the room. Be sure to follow me on Instagram for all of the behind the scenes footage and I’ll see you next week for the reveal!! Your wall does add beautiful texture to the room. 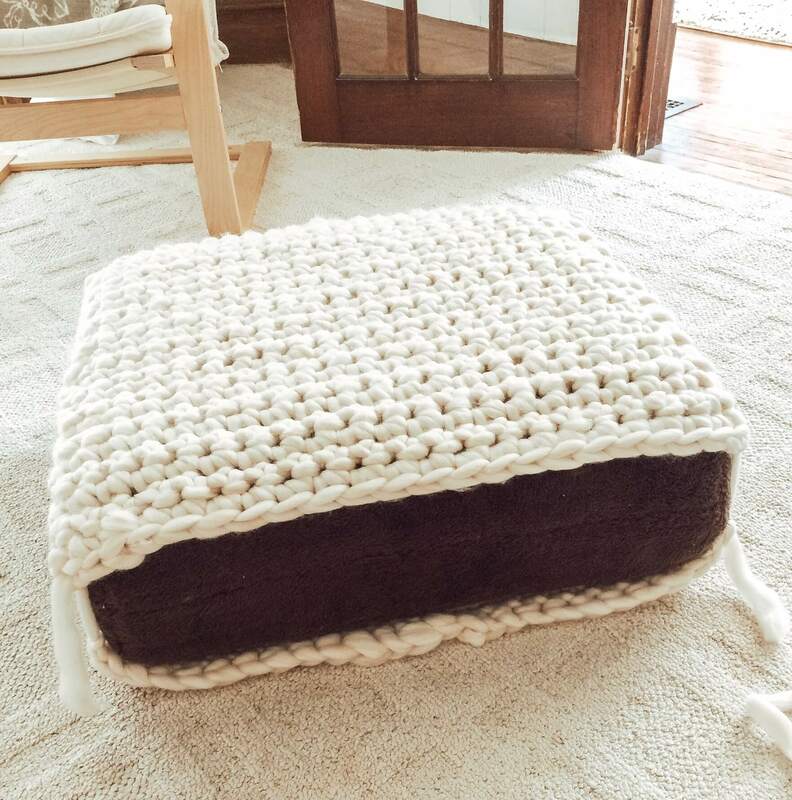 I love the crochet ottoman and it is such a smart idea. I knit so I am going to be making something like this. Thanks for the inspiration. 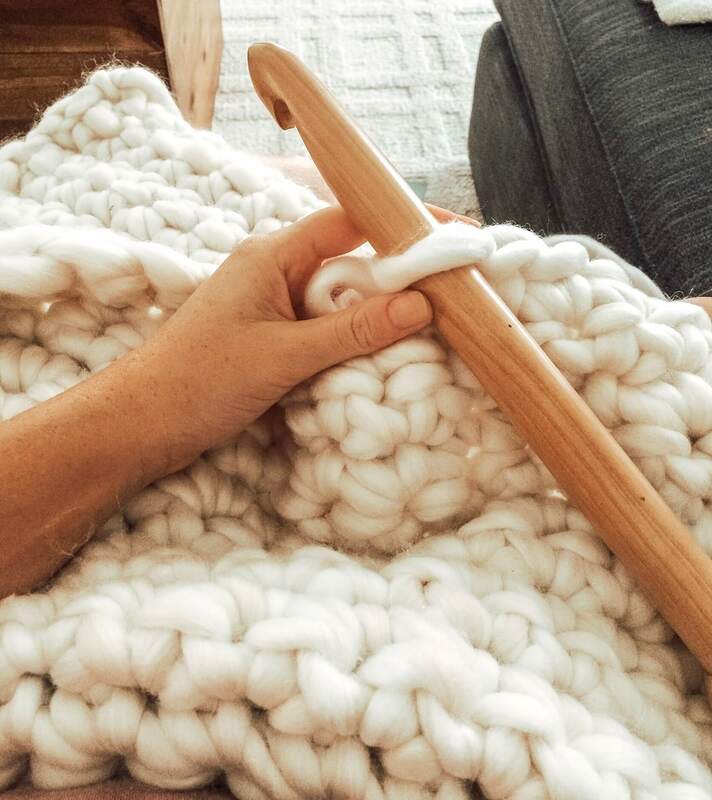 That pallet wall looks great and your knitting project is to dye for, I have been wanting to try the arm knitting of a chunky blanket in my spare time. It really is looking great and if all you have is curtains left you got this. What a fun way to cover that cushion! And I love the pallet wall. It’s a great backdrop to your white furniture. Can’t wait to see your reveal next week!